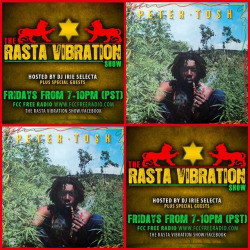 Big things agwan tonight on The Rasta Vibration Show! We have tickets to give away to see Glen Washington, Junior Toots on Dec. 21st in Oakland! We also have a interview with rising reggae artist Tony D Clutcheye and in studio guests!!! Tune in tonight 7-10pm(pst) Worldwide on www.fccfreeradio.com Studio 1A!!! Tell a friend!! !